TORRANCE, Calif. – August 19, 2011–TRENDnet, a best-in-class wired and wireless networking hardware brand, is excited to announce that Southern California Monte Jade Science and Technology Association (SCMJ) honored Pei Huang, President, CEO, and Co-Founder of TRENDnet, and Peggy Huang, CFO and Co-Founder of TRENDnet, with their Distinguished Business Achievement Award. 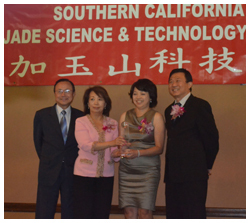 SCMJ is a Southern California Chapter of the Monte Jade Science and Technology Association, founded in 1990 in Silicon Valley, with a goal of providing a forum for high-tech executives and top level government policy makers. Monte Jade Chapters quickly expanded to major metropolitan regions within the United States. SCMJ membership consists of professionals with a primary residence in Southern California. Pei and Peggy Huang founded TRENDnet in 1990 with the goal of providing compelling networking hardware products at a reasonable price. They guided the company from startup to top-five global consumer / SMB networking hardware brand. TRENDnet now produces over 350 unique networking hardware solutions which are sold into over 130 countries. Based in Torrance, California, TRENDnet maintains branch offices in Western Europe, Eastern Europe, South America, and Asia. TRENDnet's management system is ISO certified, with an emphasis on continual improvement as an essential component of its quality management system. TRENDnet's award winning products bringing a digital home or small office to life.TRENDnet networks allow provide consumers with the ability to seamlessly talk Online, share files, exchange photos, play games, and communicate with other networked devices. Easy to use and reliable, TRENDnet allows consumers to stay connected and share what they value most. "We are honored to receive such a distinguished award from the Monte Jade Science and Technology Association," stated Pei Huang, CEO, President, and Co-Founder of TRENDnet. "We accept this award with humility and will try to honor this award with our continued strategic focus and future success." TRENDnet is a global provider of award-winning networking and surveillance solutions to small and medium-sized business and home users. Building networking solutions since 1990, TRENDnet enables users to share broadband access, multimedia content and networked peripherals for true anywhere connectivity. TRENDnet's diverse product portfolio includes Wireless, Internet Cameras (IP Cameras), Switches, Power over Ethernet (PoE), Fiber, Gigabit, Home Automation, Network Video Recorders (NVR), Keyboard/Video/Mouse (KVM), Print Servers, Powerline, NAS Media Servers, Multimedia Accessories, and more. To learn more about TRENDnet, please visit www.trendnet.com.